Disability Pension/ Liberalized Disability Pension : Both the elements of Disability Pension/ Liberalized Disability Pension, i.e. Service Element and Disability Element shall be revised by the PDAs as per pension rates provided in the specific tables. 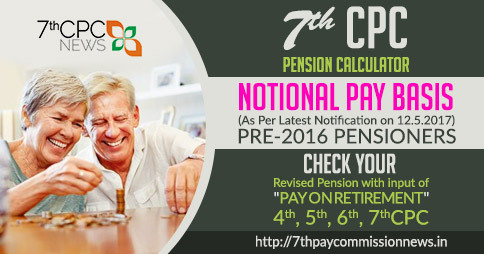 Concordance tables showing revised rates of Service Element/Service Pension for various ranks are given in Table Nos. 1 to 9. Concordance tables showing revised rates of Disability Element (in discharge and invalided out cases) for 100% disability for various ranks are given in Table Nos. Disability Pension/ Liberalized Disability Pension : OROP Table Nos. 70 to 78. Q1. What is minimum qualifying service for full pension of an officer? (a) For SSC/emergency commissioned officers who were selected from other ranks, the minimum qualifying service for pension is 12years. (b) Those officers who are medically invalidated out of service and whose disability is attributable to or aggravated by service will be eligible for pension consisting of service element and disability element. There is no minimum qualifying service required for that. (c) Those officers who are medically invalidated out of services and whose disability is neither attributable to nor aggravated by service will be eligible for service element of pension if they have a minimum qualifying service of 10 years or more. Q2. I am from ranks and I have 14 years of short service commissioned service and 06 years of service in ranks as an airman. Will I get pension for 20 years of qualifying service? Ans:- Service in ranks is fully counted for qualifying service towards pension wef 01-01-96.Before that only 2/3rd of service in ranks was counted towards qualifying service. Thus your total qualifying service will be 20 years. You will get pension for the last rank and pay held as an officer for 20 years qualifying years. Q3. I have been dismissed from service. Can I get a pension? Ans: An officer who has earned his pension i.e. has a qualifying service of 20 years can put up a mercy petition for grant of pension explaining his individual indigent circumstances ,number of dependents on him, his financial burden, his own /dependents medical condition etc. The application can be addressed to CAS/AOA. Based on the merits of the case the competent authority (AOA for AF officers) will take a decision on the matter and at his discretion, based on merits of the case, he may refuse pension or may clear restoration of part or full pension of the officer. Q4. What kind of disability makes a person eligible for disability pension? is less than 20 percent provided if disability is attributable to or aggravated by service. Q5. Who decides on the Attributability to/ aggravation factor of an officer’s disability? Ans: All officers have to undergo annual medical examination. An officer’s disease /disability is picked up either during his voluntary sick report or due to detection in annual medical checkup which is compulsory for all officers. Having picked up the disease or disability the same is treated by the medical authorities. During treatment the officer’s medical category could be downgraded temporarily. 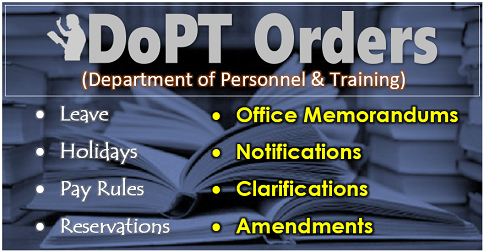 Thereafter the officer is required to undergo a medical board at regular intervals which decides on his medical category and the Attributability/ aggravation aspect of the disease. Medical officers follow very clear guideline on these matters. Similarly when an officer’s disability/injury is caused by an accident then the Attributability/aggravation aspect of the disability will be decided by his injury report/Court of inquiry recommendations on the matter. Thus it is the medical board which has the final say on the Attributability/aggravation. In case of accident cases the medical board will go through the injury report/COI on the matter. Q6. What is broad banding of disability pension? How does the disability % go up in broad banding? Ans: Govt. rules on pension show more benevolence for personnel who are invalidated out of service on medical grounds. In their case the disability percentage is broad banding to the next higher figure of 50%, 75% and 100%. Broad banding was introduced for the first time in 5th pay commission ie 01-01-1996. However for those who were invalidated out of service before 1996 there was no provision for bunching. 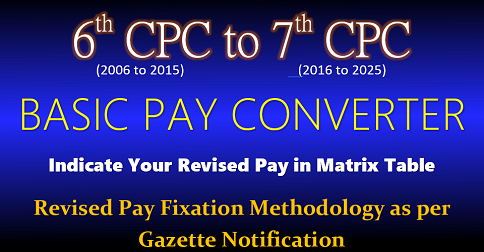 Now in 6th pay commission persons who were invalidated out of service before 1996 are now eligible for broad banding effect with effect from 01 Jul 2009. There is also a possibility of this decision of broad banding for pre-1996 invalided officers to be changed by the Govt to 01 -01-1996 in near future due to certain legal issues on the matter. Q7. What is service element and what is disability element? Ans: Service element is similar to retiring pension whereas disability element is a pension specifically given for the disability which was attributable to or aggravated by service. Q8. Is income tax exempt on both service element and Disability element of pension? Ans: Yes, income tax is exempt on both. Q9. Is there any DR on constant attendant allowance? 50% CAA will increase by 25%. Thus the Rs 3000/- pm CAA stands revised to Rs 3750/- pm wef 01 January 2011after DR has crossed 50%. Q10. What is the rate at which Disability element of pension is given? (b) War injury pension, normal release – 60% of last reckonable Emoluments. Note. The above rates are for 100% Disability, for lesser disability it shall proportionately get reduced. Q11. If a person has more than one marriage which wife is entitled for family pension? Ans: Only legal wife is entitled for Family pension. The lady with whom the officer has got married for the first time is the legal wife. Any other marriage done before the death or legal divorce with first wife is null and void in the eyes of law. Q12. I was married to my husband when his divorce proceedings were going on with first wife. He got divorced from first wife after few months of our marriage. Am I entitled to family pension? Ans: Since your marriage took place when the first wife was still the legal wife, it is null and void in the eyes of law. You should have waited for her legal divorce before your marriage with her husband. The fact that her divorce took place few months after your marriage does not make your marriage legal. Since your marriage was ab- initio null and void it will continue to remain null and void in the eyes of law and therefore you are not entitled for Family pension. Q13. My first wife is not loyal to me can I write a will to grant family pension to my second wife with whom I stay? Ans: Such incidents have happened in the past and such a will has been challenged in court of law. The court rulings are very clear. Since will can be written only on own property and family pension comes out of Govt money for a social cause therefore any will on family pension is illegal and hence null and void. Family pension will go to legal wife only. Q14. I am the mother, my son died in an air crash as an IAF pilot. He was recently married. Will I get family pension? Ans: Parents can get family pension only for a bachelor officer or an officer who has not left behind any widow or child after his death. In this case the officer’s widow will get family pension. Q15. 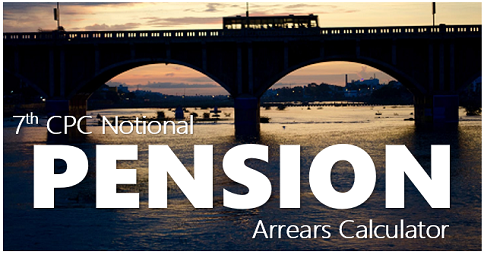 What is the eligibility to Family pension after remarriage of a widow? Ans: Widows who are in receipt of special family pension (SFP) and liberalized family pension (LFP) will continue to get their SFP/LFP after remarriage provided they support their children after remarriage. If the widow does not support her children then her family pension will be divided between her and her children till they attain 25 years of age. However if a widow in receipt of ordinary family pension (OFP) remarries then her Family pension will continue only if she is childless at the time of remarriage. If she has children her family pension will stop and get passed on to eligible children below 25 years of age. Q16. What are the rules on eligibility of Family pension for children if both parents expire/become ineligible? Ans: When both parents/ single surviving parent, eligible for pension expire/ become ineligible, then Children below 25 years of age unmarried and unemployed (income less than minimum Pension of Rs 3500/-pm +DR) will be eligible for family pension. The Family pension will start with eldest child below 25 years of age. Once he/she is 25 years of age it will pass to the next child in line who is below 25 years. For release of family pension to a minor child a legal guardian will be required from a court of law till the child is 18 years old. If there is a handicapped child eligible for life long pension then Family pension to handicapped child will be issued only after all other eligible children below 25 years have received their share of Family pension. Q17. What are the rules on eligibility of Family pension for handicapped children/ handicapped siblings? Ans: Handicapped children (not capable of earning livelihood for life) are eligible for family pension for life after the death of both parents. Such children have to be examined by a competent medical authority and a certificate from the doctor (not less than the rank of Brigadier or equivalent) as per prescribed format will be required. Married handicapped children are not eligible for this pension. A legal guardian for such children should be nominated by parents in their life time. Handicapped siblings (brothers and sisters) are also eligible for family pension on similar lines as handicapped children. For Endorsement of the name of handicapped child/ sibling in the PPO, an officer can apply during his life time itself. Applications for the same should be sent to Dte of PP&R. Q18. What are the rules on eligibility of Family pension for unmarried/ divorced/ widowed daughter? claims. Her name will not be annotated in the PPO during parent’s life time. Applications by eligible daughters should be sent to Dte of PP&R. Q19. What are the rules on eligibility of Family pension to Wife/NOK of missing personnel in service or after Retirement? Ans: Ordinary family pension is admissible for personnel who are missing in service or after retirement. The family pension can commence six months after lodging of missing FIR. For cases of missing personnel while in service, an inquiry at the unit level must establish that the person is actually missing and is not a deserter. The same has to be supported by Police investigation reports on the matter. For cases of missing personnel after retirement the family pension will only be admissible to widow/NOK if the missing officer was in receipt of service element of pension and the police investigation report establishes clearly that the retired officer is missing. Thereafter in such cases Family pension will be released after proper audit verification. Q20. My husband was getting two pensions one from IAF and another from the central Govt job taken up after premature retirement. He has expired recently; can I get two family pensions? Q21. How can I collect pension of my husband who is very sick and not in his senses? Ans: Whenever a pensioner is sick to the extent that he/she can’t sign her bank cheques then they are permitted to put Thumb impression on the cheque. In addition for pensioners who are in comatose state i.e. unconscious/ or mentally not stable, a legal guardianship certificate from district court will be required by the bank and there after the bank will release pension to the legal guardian. For the purpose of submitting yearly life certificate for such pensioners, the bank should be requested to send an official at the home of pensioner so as to physically verify the pensioner and then issue the life certificate. Q22. I am a widow drawing family pension. I am not keeping well, I want to shift permanently with my daughter staying in another state. What is the procedure to shift my pension account to another bank/branch of same bank? immediately apply for transfer. Depending on banks efficiency the procedure can take 4-10 weeks. It can take longer if there is transit loss of documents. Widows must activate their jointly notified family pension and should draw their family pension for few months before applying for change of PDA. Q23. My husband was invalided out of service two years ago due to injuries in an air accident. His disability was attributable. He has recently expired and I am in receipt of Enhanced ordinary family pension. Can I get Special Family Pension? Ans: If an officer is invalided out for a disability which is attributable to or aggravated by service and dies within seven years of his invalidation then his wife is eligible for special family pension if the death, as per medical opinion, is caused due to the disability for which he was boarded out. In such a case the lady should contact Dte of PP&R at Air HQ for further advise. Q24. What is the difference between Family pension and dependent pension? Ans: Family Pension is paid to the widow/child of an officer who has died while in service or after retirement. A claim for dependent’s pension arises in favour of parents/ eligible brothers and sisters (in the absence of parents) of the deceased officers who die as a bachelor or widower without children. Q25. Are the rates of dependent pension for parents same in cases of death which is attributable(similar to SFP) and death which is not attributable(similar to OFP)? Ans: The rate of dependent pension for not attributable to or aggravated by service(NANA) cases of death corresponding to OFP and for attributable to or aggravated by service cases of death corresponding with SFP is same i.e. 30% of last reckonable emoluments. The only difference is that for NANA cases corresponding to OFP the means limit (income) criteria is there i.e. 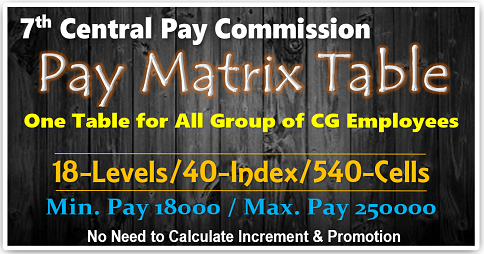 income should not be more than Rs 3500/- pm +DR. However for cases corresponding with SFP there is no means limit but the rates are authorised at 50% of SFP i.e. 30% of last reckonable emoluments. However For death case corresponding with LFP the rates will be 75 % / 60% of last reckonable emoluments for both parents /single parent being alive respectively. Q26. Are parents of a bachelor officer eligible for Family pension if he dies after being invalided out/retirement? Ans: Parents of a bachelor officer who dies after his invalidation /retirement will be eligible for Family pension only if they both were dependent on him while he was in service. Q27. Are Flt Cadets entitled to pension? Ans: Flight Cadets (direct) are not entitled for pension like commissioned officers/ other ranks. However they are entitled to Ex Gratia awards for disability and death. Q28. What are the current rates of Ex Gratia awards for disability and death for flight cadets? * CAA is admissible for 100% disability, on recommendations of IMB. Q29. Flt cadets join AFGIS when they join IAF. What are the benefits from AFGIS for flt cadets in case of death or invalidation during training. Ans: As on date (in 2011) the death cover by AFGIS is 50 lacs. In addition Every Flight Cadet of IAF who is a member of Air force Group Insurance Society (AFGIS) and who is invalided out of training on recommendations of an invalid medical board on account of disability will be provided disability benefit at half the rate of life cover for 100% disability. For lesser disability the amount will be reduced proportionately. Attributability/aggravation to service is not a factor for granting this claim. However this benefit is for a disability of 20% and above only. In addition if a member is invalided out within one year of enrollment and the disability is not attributable to service, the member will not be eligible for this benefit. This payment is not from public funds but welfare funds i.e. AFGIS created by contribution from serving and retired IAF personnel. Q 30. What is the concept of ECHS treatment? Ans: ECHS facility for ex-servicemen is on the same lines as CGHS facility for retired central Govt employees. Q 31. Who all are eligible for ECHS? Ans: All Ex-servicemen who are in receipt of pension, including disability and family pensioners and their dependents are eligible for ECHS membership. Q 32. What is fixed medical allowance in lieu of ECHS facility? member. However pre – 01 April 03 retirees/family pensioners had an option to opt for ECHS or remain out of it. Those pensioners who opted to remain out of ECHS are entitled for a fixed medical allowance per month. Earlier this amount was Rs 100/- pm. Now wef 01Sep 08 it has been increased to Rs 300/-pm. Such retirees still have the option to become ECHS members after completing certain formalities, they can contact nearest ECHS Regional Centre for the same. They can also get relevant information on ECHS website. ECHS official website is http://www.indianarmy.nic.in/arechs.htm. Alternately to reach ECHS website type ECHS army on Google or any other search engine and the first site listed there will normally be the official website of ECHS. Q33. I am a pre- Apr 2003 pensioner. I had opted for drawing medical allowance earlier, now I want to join ECHS please advise me on the procedures. (a) ESM who Retired prior to 01 Jan 96. Those pensioners who wish to join the ECHS do not have to pay any subscription as per the prevailing GoI Orders. (b) ESM who Retired from 01 Jan 1996 to 31 Mar 04. Though the scheme was made compulsory wef 01 Apr 2003, the money from PPO was deducted from 01 Apr 2004. Those pensioners who have retired between 01 Jan 1996 to 31 Mar 2004 and now want to take ECHS membership (on or after 01 Jun 2009) will have to pay the revised rates of subscription effective from 01 Jun 2009 i.e. Ashok. S Majagi I am disability pensioner, Rightknee (Operationed) getting pension Rs,4511/-6th pay commission circular no 596&599. Disability pension was increased DA 119% add to the Disability Basic,And Govt announced 50% add to basic Rs.1755+1044 50% out 100% Disability=2088(1755+1044) 2799×2.57=7193. And +DA. 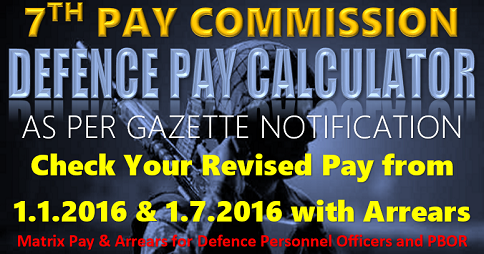 Disability pension announced still last 2016 January. I am getting 20% of disability & getting 1207 Rs disability pension and I got my basic is 44000/_. what should I supposed to get after 7th pay commission. Please reply me as soon as possible. I was medically board out from Indian Army as on 30th April 2008 with 50% medical pension. 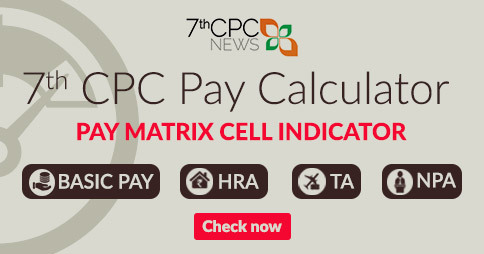 I am unable to calculate my disability pension after 7th CPC. Please calculate and conform me in my mail address. I was discharged from service in 1994 on medical ground with disability 50%.after discharged from service i was suffering stomach ill caused peptic ulcer and surgeryed in military hospital also I am suffering from backache causes disc problems l1 l2 l3 s1. this has been done before ten years after discharge.. disability benefits of the above mentioned diseases has not been received so far. I got 20% disability and Rs, 1208. pm my basis in pre 2016 is 13610 with x gp. I retired in July 2016. My new basic as per LPC is 42800. 1. Is my existing disability pension RS. 1208 is correctly calculated. I retired as Subedar A group on 31.05.1996 with 20% disability. What shall be my disability pension. Is it @ rate of Rs. 6969/- as 100% disability? I Ex SGT G Prem Kumar Retd in March 2016 with 50% disability (Mental illness) as NANA case . Please guide me whether I am eligible for disability pension or not..
I’m getting 20 percent of disability in penatrating injury rt eye attributed to the military service vision of rt eye 6/60 pleas intimate basis 7th pay commission what’s my disability pension till date my service is 24 yrs Hav.